all questions from the parents survey. children. Please click the link above. for regular and bilingual classes, $50 for credit classes and $100 for the graduation class. Please encourage your child to study. Everyone has the chance to win. start in 2 weeks. We appreciate your consideration in advance! 2019-2020 will take place and need your participation. Please come and vote. child to bring all coupons on that day. ceremony will be on week 29 (05/05/2019). waived if you register before 05/31/2019. No school on 04/14/2019 and 04/21/2019. Spring Break. performance has always sold out in the past, it’s definitely worth seeing. Afternoon during the school year. The room is in US101. you have not submitted your preference! Your help would be a big contribution to our school. new recycling policy at LJCDS campus. kindergarten/preschool students only. Other students are forbidden to use that facility. and pricing. Thank you for your support! Academy Facebook page. Remember to “Like” and “Follow” the page. account. 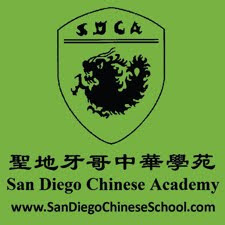 Choose San Diego Chinese Academy as your charity when prompted. Bookmark or point your browser to http://smile.amazon.com every time you shop.